A few weeks we got a new vacuum as our old one didn’t really pick up the dog hairs. And while we was in the Walsall Clearance Bargains shop, this is part of Argos selling discount products like ones that are surplus to the new catalog or even customer returns within the 16 day money back period. All products still come with full 12 month warranty. They had on offer a VAX Air3 Pet at half the price we had looked at in other stores the week before so thought just get one, so here is quick review of the VAX air3 pet now known as VAX Air Steerable Max Pet. The shop prices for this vacuum is between £100 – £150. Now for this price you get a large capacity of 3 Litres and 9000w of suction power. Our old vacuum was an upright of 1400w so wasn’t that sure about going to this low of power. In the box you get the vacuum the handle which is extendable and can act as extension for the pipe, flat upholstery attachment, 2 in 1 crevice and brush tool and then a turbo tool which has rotating brush in it. These vacuums are design for people with pets, our dog is a American bulldog now her hair is short and course and really does grip to the pile of the carpet. On first setting up the vacuum which was easy just attach the extendable handle and ready to go. The first time of using it we had vacuumed with our old one only about 3 days before using it, and to be honest was amazed by the suction on this vacuum, in our kitchen earlier this year we put a cheap black cord the carpet down this was only as we had redecorated the kitchen and couldn’t decided on what laminate flooring yet. This carpet is the worst to have first black and shows any bits at all and because it being cord our dog hair, just kept getting within the fine pile. Using the Vax it just pulled every little bit up and looked a hell of a lot cleaner. I did the living room now this is a thinish pile carpet only been down around two years and a large rug that has a thick soft pile and the vacuum picked up perfect to the point was picking up so much dust the just for the living room it had nearly filled to the max of the reservoir. Now like I said we had vacuumed about 3 days ago, both carpets are a light and dark drown our dog has light brown hair so normally can’t see her hair on the carpet, but was really amazed now much from what I thought was a clean carpet how much it picked up. Top be honest I felt ashamed how dirty the carpets seemed to be as always keep the house tidy and clean, this does go to show what a difference a brand make or a product does. The older vacuum we had was Asda’s own make “Genie” upright vacuum rated at 1400w and around 3 years old and every 2 months the filters had been washed and cleaned. So really does make a difference spending that bit more as from our experience it makes an amazing difference. The dirt reservoir is very easy to empty as you have just to unclipped from hoover and press clip on bottom and all the dirt just falls out. The filter just unclipped so can easily be cleaned and they recommend every month or so giving it a full wash and clean to get the best suction. The hose can be unclipped from the bottom for use on stairs you can remove the handle to give that extra length, but the flexi hose isn’t really that long, and can make doing the stairs or side a bit difficult, though I have looked a vax do sell an extra flexible hose at around £20. The movement on the value is good as it has a steerable front, it’s not as good as something like the Dyson ball but the price of this one is a lot cheaper. We have had no problems with moving over any suface, the brush at the front can be turned on and off, normally when on you get a light on the front which is green, I must admit this is a very bright light. and if something gets sacked up into the brush and starts to block it the vacuum will switch off the brush and the Green light turns to red so you know you may have to free something from the brush. Most of it can be taken apart for cleaning of the front brush, though haven’t yet had to do that, and not yet washed and cleaned the filter after a months as still the suction is great. The manual does give this info on how to clean etc. you do get a small turbo I brush attachment for hard to reach areas which does have a suction propelled brush, though myself haven’t found this that good and is a bit fiddly to use. 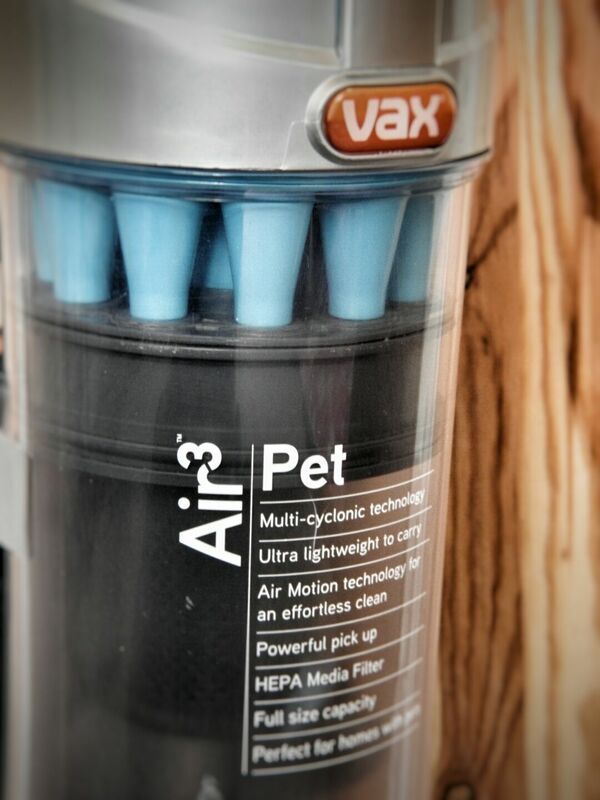 All in all this is so far the best vacuum we have had, amazing suction, easy moveability, fairly light weight and great for pet hair, after having our my mom went out and brought one straight away aswell. So if looking for a vacuum if you especially have pets I would look at the vax range as worked for us and for the half price that we paid was amazing value for money. Use the Vax Air3 Max Pet U88-AMM-Pe Upright Bagless Vacuum Cleaner to clean your home and remove those stubborn pet hairs. This attractive and powerful vacuum cleaner from Vax is specially designed to be able to clean all floor surfaces around your house including carpets, hard floors and stairs, so it’s easy to keep your house clean from top to bottom. The Vax U88-AMM-Pe’s even has an upholstery tool for vacuuming your furniture to help lift pet hair and dirt easily from your pet’s favourite seat in the house. There’s also great news if you suffer from allergies as this Vax Air3 Pet Bagless Vacuum Cleaner includes HEPA media filters, which help to trap allergens inside the cleaner instead of leaving them in your house. With its 3-litre reservoir capacity, the Vax Air3 Max Pet U88-AMM-Pe Upright Bagless Vacuum Cleaner is an ideal solution for your vacuuming needs.